The Crownstone infrastructure can be used in smart offices for sustainability and communication. It has been integrated with the Yodiwo platform. 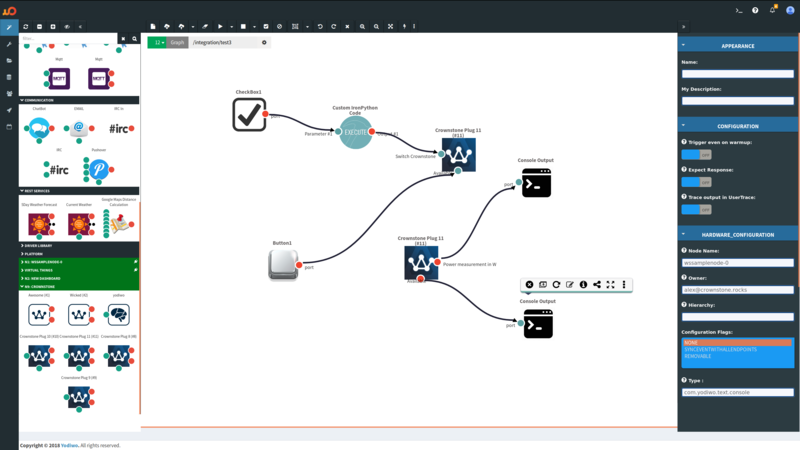 The Yodiwo platform contains a graphical user interface, called Cyan, in which development and deployment can be done in a visual style with graphs. Network devices, cloud services, analytics are blocks that all can be linked together in a graphical user interface. 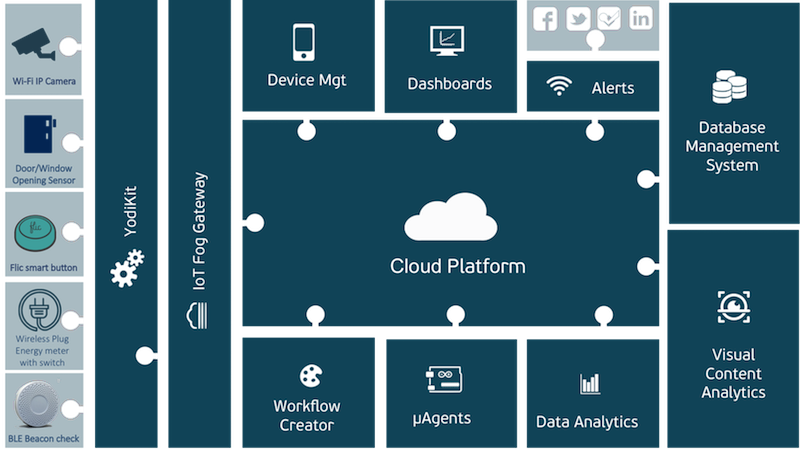 The Yodiwo platform also contains a hardware device (IoT Fog Gateway) that can function as a gateway to and from the premises of a building. The architecture of Yodiwo is visualized in the following picture. The Crownstone integration has two parts. The first part is the graphical user interface. The second part is a USB device that can be plugged into the Yodiwo hub. First, components have been created that can be used in the graphical user interface. Those components are shown in the next picture. Crownstone has created several graphical user elements and the software behind it to control Crownstones from the Yodiwo interface or read sensor data. The software that is behind those elements is written in Python and can be found at the yodiwo-crownstone-node repository. This code makes use of the yodiwo-python-node, a node written in Python that accesses the Yodiwo cloud services using Yodiwo’s Plegma API. The Bluetooth stack on a gateway is often not really robust. A common stack is “bluez” and for example Android has developed “bluedroid” because of quality issues with “bluez”. Although Android is using “bluez” again, its cross-platform stability and performance is still not what it can be. The diversity of Bluetooth devices is such that having a Bluetooth stack is only part of the development. For each device a set of services and characteristics has to be written and read, in-band encryption implemented, and all these services and characteristics have custom protocols with respect to the order in which they have to be accessed. There is not yet standardization with respect to this. 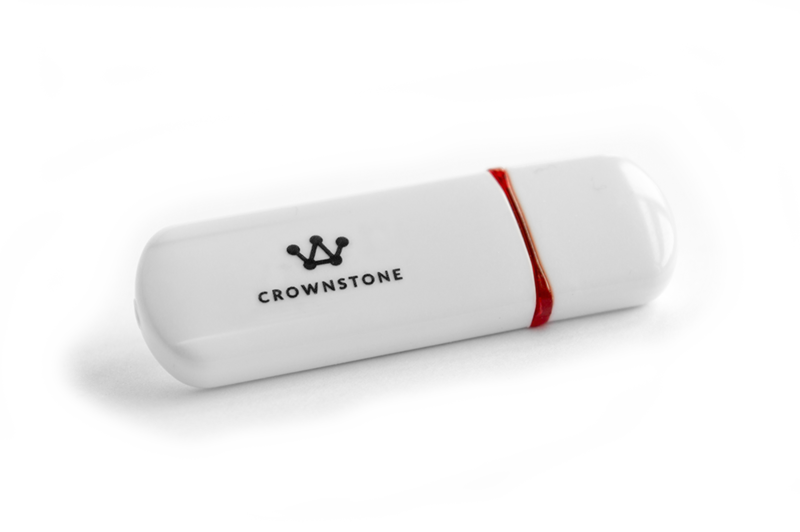 To maintain a standard Bluetooth Low Energy connection - to one of the Crownstones - introduces additionally latency with respect to the remaining Crownstones. 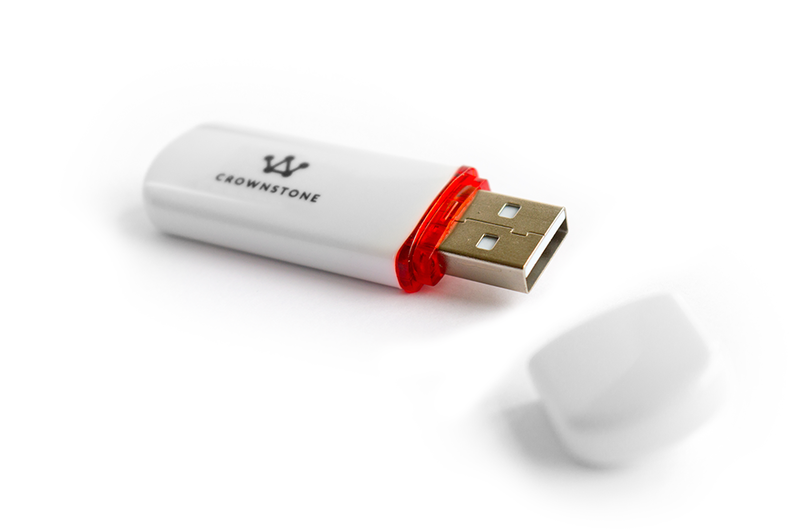 By implementing the Bluetooth stack including our mesh directly on the Crownstone USB dongle we can immediately send messages into the mesh. This means lower latencies. Note, the USB dongles can be obtained from the webshop, but should only be bought in the context of a project. Very quick roll out of energy monitoring solutions for big corporate clients. Deploying the software, and rolling out new software updates can all be done from the Yodiwo graphical user interface. After installing Crownstones at site and placing a Yodiwo gateway, the software rollout is basically just the press of a button. To allow people to turn on/off lights based on their presence. To set time schedules for printers, coffee machines, and monitors, for instance to switch them off at night. To monitor particular appliances but disallow anyone to actually switch them off, or even set a warning signal if an appliance is switched off. Localization information of people can also be synchronized through the Yodiwo platform with meeting room schedules. Moreover, if people are not present in the meeting room it is possible to cancel the registration so someone else can make use of the room.